Even on Martin Luther King Day, racism aimed at public figures is still alive and kicking on Twitter. During a post-game, somewhat egotistical rant, Seattle Seahawks cornerback Richard Sherman made a jab at his opponent, San Francisco 49er Michael Crabtree, which was pretty upsetting for any 49er fan that was listening. For those of you not so Super Bowl-friendly, the Seattle Seahawks played against the San Francisco 49ers in the NFC Championship Game Sunday night. With 30 seconds left in the game, Richard Sherman wowed viewers by deflecting a pass that was heading for Crabtree — all the way to Seahawk Malcolm Smith, who caught the ball and essentially ended the game. After the game finished, Fox reporter Erin Andrews stopped to talk to Sherman. A bit of history: Football fans have long bemoaned the fact that the game's athletes have become, well, boring. Given that, you might understand why Sherman's interview was pretty shocking. Here's a sum-up of what Sherman said, via nj.com. Andrews: “Take me through it (the interception) ..."
As soon as the interview aired, the Twitter backlash started. And this wasn't just Twitter's everyday routine of name-calling and immaturity — it was a deluge of racist epithets and comments. Some of the worst offenders were named and shamed by Deadspin, while others took screenshots. A few hours ago, Sherman has published an op-ed on Sports Illustrated's blog, MMQB, headlined, "To Those Who Would Call Me A Thug Or Worse." He apologized for his outburst, but maintained — and rightly so – that he didn't deserve to be racially attacked on Twitter. Nevertheless, Sherman's own Tweet won the Internet last night. 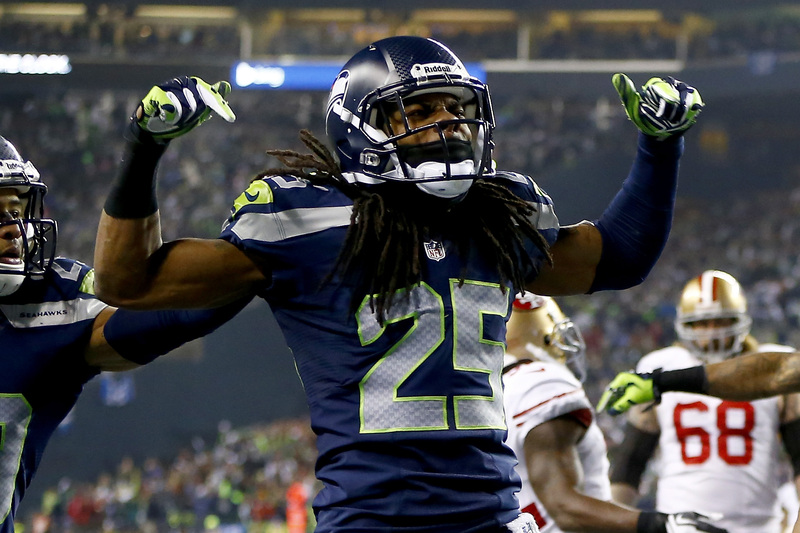 While the Twitter backlash wasn't pretty, we're sure Sherman will be happy to consider what's next: the biggest game of his lifetime, and the Seahawks' second time ever to make it to the Super Bowl. And even if you're not a football fan, there's plenty in store for you, including a Kanye West video spoof; Bruno Mars and Red Hot Chili Peppers at the halftime show; and some diamond-encrusted NFL helmets.